Jammin’ with my Kala Ubass | 49 ”Tango pour Claude” Richard Galliano | Rehearsal [COVER] – Play UBass! Ok it’s time for my 49th video in the jamming’ series. This is a great one! On the link above there is a few song samples from the upcoming album AND also an old update to my upcoming interactive UBass Bass method! More about this later! If you have followed me for a while you know that this project has been going on for a couple of years by now! When will it be ready you might ask!? Well, it has taken quite a while mostly because the focus is different constellations for the different songs. I have recordedNow I have finally decided on how to release the songs and I will send out a newsletter soon letting my newsletter subscribers in om my plan! If you’re not already a subscriber please sign up here! In the upcoming newsletter I will also try to release a snippet from one or two songs! 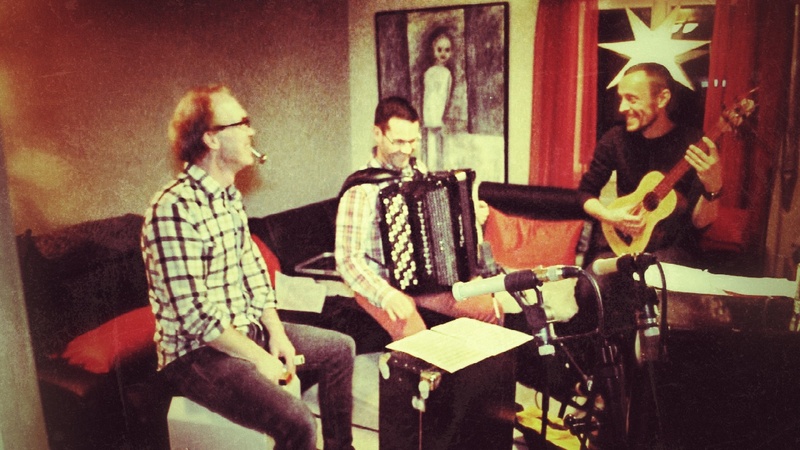 Once we were done recording the overdubs we also did a few play-throughs of a tango the accordion player had suggested we play. I hope to record more with these fantastic musicians and the song in this video might also end up on a future ubass album! On this video you’ll hear the great Tommy Nilsson on accordion. He works as a free lance musician and a music teacher. He plays a accordion he bought just the day before. Side note: The Rämjes accordion is imported by a music store that I used to visit while I was younger living in Trollhättan, quite a coincidence I think! Lasse and Tommy discussing the arrangement. Lasse, Tommy and my trusty RMI Sonic Spark and Basswitch! Playing wonderful percussion (cahon and finger shakers on the track) is Lasse Fhager. He is currently working as percussion player (mainly as a timpanist) in the world reknown Swedish Chamber Orchestra that is based in Orebro, Sweden. He also used to be my drum and percussion teacher while I studied at the Örebro University. The track they overdubbed parts to will be mixed and hopefully included on my, above mentioned, first Ubass focused album and I can hardly wait letting you hear it! The song in the video is written by french accordion player extraordinaire, Richard Galliano.